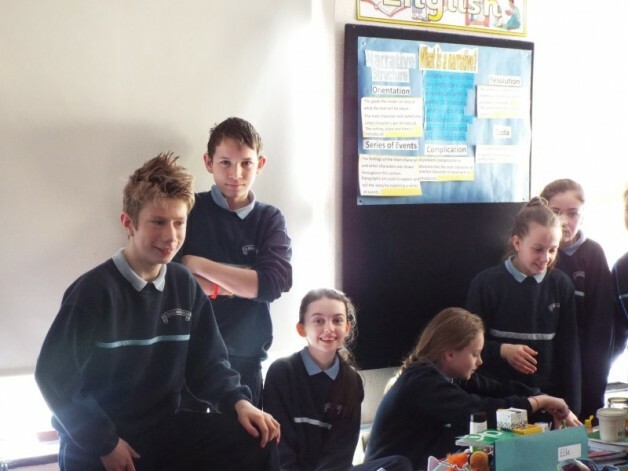 The Trendy Trash group in sixth class, made up of Patricia Howard, Sabrina Nestier, Lucy Shanahan Marsh, Roisin Murnane and Ellie Hession brought in natural and household ingredients to make their own skincare products. Lucy made her own lip balm with shea butter and coconut. Patricia suggested that coconut oil is very good for your hair and could be used instead of a gel. Daniel Spaight volunteered to try it out and was happy with the results. Patricia also made a cleanser with aloe vera, lemon and oats. Sabrina and Patricia also made a mask using banana, avocado and oats. 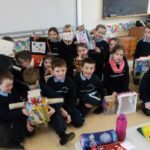 Some of the sixth class volunteered to test out their creations. Lucy’s sister Nicole who is a beautician came in to the class on the 14 of March to talk to the class about skincare and the chemicals which can be found in skincare products. 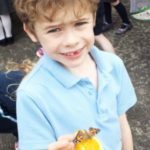 She told the class that it was quite easy to make homemade face masks for example but cautioned that your own home-made products would only last a week maximum. They do not contain preservatives. Preservatives in skincare products are often the chemicals which can be harmful according to Nicole. She also said that some natural products can cause allergic reachtions so people need to do a spot test first just to be safe before they try making their own products at home. She said that lavender oil for example can cause rashes and swelling for some people and even beeswax can cause allergies. Nicole also talked with the Trendy Trash group to help them with their campaign. ← Bridgetown Boys Win Basketball!